It’s winter: Cue the comfy blanket, the oversize pajamas, a toasty cup of hot chocolate and your collection of feel-good, do-nothing movies. 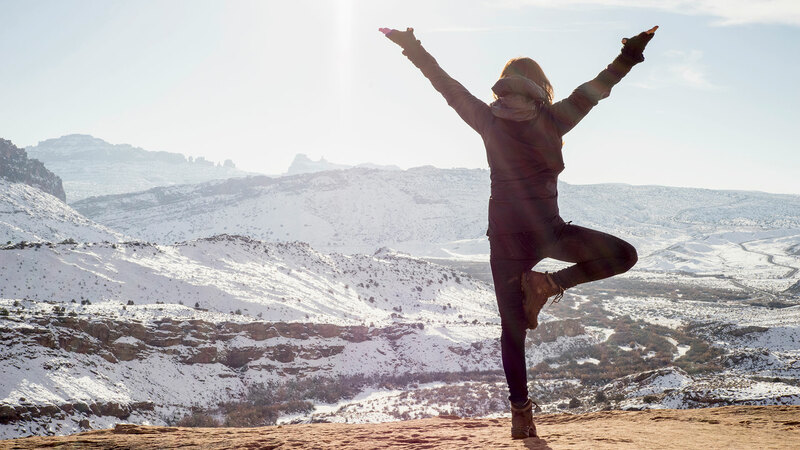 Though wintertime definitely equates to far more time cuddled up on the couch or hiding away from the meteorologist’s warnings, certified health and wellness coach and personal trainer Jane Diamond reminds SheKnows our health doesn’t hibernate. Even so, this time of year, motivation is often an uphill battle… in the snow. This actually creates a setback when the weather changes and we go back to warmer-weather routines but now lack the stamina, endurance and motivation to recreate the same fitness regimens we had just a few months ago, she adds. If you feel like you have a season pass on the struggle bus when it comes to winter exercise, steal these tips and tricks from fitness professionals. In addition to benefiting your outward physique, working up your heart rate also gives you an extra hand in fighting against seasonal depression. As fitness coach and expert Nadia Murdock explains, many people experience more intense symptoms of sadness when the nighttime comes sooner and the days are colder. Let your moods foster your determination to actually make it to the gym or keep the promise you made to your bestie about the Saturday morning spin class you booked together. After all, if you’re feeling less than stellar, staying home and avoiding socializing won’t help your case, but punching a bag will help you blow off steam and feel energized. While effective, completing the same-ole, same-ole 30-minute run and 15-minute weight-lifting session at the gym can start to make you yawn just thinking about it. Especially when there are a few inches of snow on the ground and you’ll have to bundle up to just to have to take it all off once you arrive at the gym, you need something exciting to fuel your spirit. Murdock suggests signing up for a new boutique fitness class you’ve never tried, serving as the spark of curiosity to get you moving — literally. “The excitement of trying something new will help increase motivation. Step out of your comfort zone and look into classes you have been wanting to try or are out of the norm, like indoor water paddling, Buti yoga or a new cardio dance class,” she says. If you’re the type of person who never wants to let down those you care about, making the shift from participant to teacher may help foster a renewed engagement to wellness. As Diamond explains, if you’re already an experienced fitness pro, you can turn your knowledge, dedication and experience toward someone who could use the guidance. “Is there someone you know that would like to take a class or begin running? Become their buddy. Giving back is one of the greatest ways to create joy,” she shares. Or if your living room allows, consider putting together a 45-minute high-intensity interval training class for your neighbors to join. When you know they’re coming over at 9 a.m. — regardless of snow, sleet, ice or rain — you won’t be tempted to sleep for just another 10 minutes. Depending on what season your friendships are currently cycling through, you might feel like the lone enthusiast who actually wants to work out. Since your lifelong pals are having children, planning weddings or exercising their passport more than their bodies, Murdock suggests finding new like-minded pals who want to commit to a gym routine. “There are several new sites and apps that offer support when looking for friends of similar interests. These apps are no-strings-attached and strictly platonic,” she shares. Not sure where to get started? Murdock suggests Hey! Vina for women-only fitness, while ZogSports organizes intramural teams and social events. After all, having support and accountability partners really makes a difference when you’re struggling to maintain your schedule in the frigid temperatures. It’s not only your mental stamina that inspires you to work up a sweat when you’d rather be stationary, but it’s also how rested you feel when you wake each morning. As Diamond notes, if you’re not reaping the benefits of a thorough night’s slumber, it’s less likely you’ll have enough steam to squeeze in an hour-long sweat sesh. Not only does it let you wake up ready to tackle your work and that hot yoga class, but it’ll help you manage your eating habits too. “It’s vital to create good sleep habits. When we don’t sleep, we are not alert, energized or motivated. We have a tendency to confuse hunger with being tired and overeat,” Diamond adds. So stay awake and get moving, and spring will be here before you know it.